Another member to be added to the list of Beeston Old Boys who made the supreme sacrifice in the Great War was Private Horace Arthur Blackwell. He was born in Bramcote on 27th March 1898 and was the youngest of five sons of William Joseph and Sarah Ann Blackwell. Horace Arthur also had eight sisters1. William Joseph Blackwell was a native of Stapleford, and was well known as a commercial traveller in iron and steel. The family moved to Beeston in the early part of the new century to 15 Park Street, later moving to 9 Collington Street, where young Horace lived before he enlisted in the Army. Like many of the others from Beeston to lose their lives in the Great War, Horace Blackwell attended the Church Street School under the guidance of the headmaster Mr John Riley2. Later he became a member of the Beeston Old Boys Association, but there is no record of his name appearing on the Lads Club Register which commenced on 1st May 1909. We do know however that as a young man he spent many happy hours on the Chilwell golf course, not only as a fine player but also earning some money as a caddie. Being nearly six feet tall and well built, he was also a capable footballer. Until June 1915 he was engaged at the Bartons Motor Garage where he was being trained as a mechanic. In June 1915, the young apprentice car mechanic enlisted in the army at a Recruitment Centre in Nottingham, soon afterwards joining the forces with the 7th Leicestershire Regiment, which was one of Lord Kitcheners new service battalions, formed in Leicester in September 1914. The story of the Service Battalions has been exhaustively documented by Matthew Richardson in "The Tigers"3. Matthew describes how the Service Battalions were made up largely by men from skilled occupations - hosiery hands, engineering apprentices, clerks and office boys, drawn mainly from upper working-class backgrounds. Together, the four Service Battalions formed in Leicestershire made up the 110th "Leicestershire" Infantry Brigade joining the 37th Division on Salisbury Plain, and usually served alongside each other throughout the war. On the 29th July 1915 the battalion embarked for France. Private Blackwell became adept with a rifle, receiving his marksman certificate while in training with his regiment. Moving to France he was engaged as a sniper when he went into the trenches. On 7th July 1916 the 110th Brigade became part of the 21st Division, taking part in their first major battle on the night of 13th/14th July 1916, after a successful attack on the Bazentine-le-Petit village and nearby wood on the Somme. It is not known for sure whether Private Blackwell took part in this exploit or was part of a draft to replace the 18 Officers and 535 other ranks, killed, wounded or missing during this action. The depleted battalion marched north to Agnez Les Duisans, near Arras, and after eleven days spent chiefly in training, bayonet fighting and physical training, the newly constituted 7th Battalion went back into the front line trenches at 11pm on 7th August. We do know for sure however that Private Blackwell was only 19 years of age when he was killed on the Monday 1st October 1917 after serving fifteen months on foreign soil. He was one of the 108 Officers and men from the 110th Brigade who perished on that day. At 5am three strong infantry attacks were launched by the Germans supported by ground attack aircraft on Glencorse Wood and Black Watch corner in particular4. It was during these enemy attacks in the region of Polygon Wood that Private Horace Arthur Blackwell was reported missing believed killed in action and, like so many more of his colleagues, his body was never found. His name was recorded on Panel 50 of the Tyne Cot Memorial. Two of Horace Arthur's brothers also served with the colours. 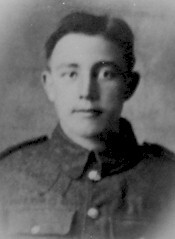 Private Joseph Charles Blackwell, the eldest (born 1891), worked as a stores clerk in a Government factory before enlisting in the South Notts Hussars. He was serving in Egypt when Horace died, was hospitalised with malaria in Palestine and was later wounded while serving in France. Private Herbert Owen Blackwell, who was a year older than Horace, worked as a miner at Trowell Collery prior to enlistment in 1914, when he joined the 20th Hussars. He received injuries after being thrown from his horse. Tyne Cot Commonwealth War Graves Cemetery and Memorial to the Missing - this memorial is a Commonwealth War Graves Commission (CWGC) burial ground for the dead of World War One in the Ypres Salient, on the Western Front. The cemetery grounds were assigned to the United Kingdom in perpetuity by King Albert I of Belgium in recognition of the sacrifices made by the British Empire in the defence and liberation of Belgium during the war. On the forward slope of the Passchendaele Ridge is the largest cemetery for Commonwealth forces in the world, for any war. The cemetery and its surrounding memorial are located outside of Passchendaele, near Zonnebeke in Belgium. The Cross of Sacrifice is to be found in a central position in the cemetery, at the base of the cross a small patch of the original German Block House can still be seen, contained within a bronze wreath, while on the far side, between it and the memorial wall, is a collection of some 300 graves. These are the original battle-field burials left where they were found after the Armistice. The other some nearly 12,000 graves which stand in parade ground order, were brought in from the surrounding area after the Armistice. 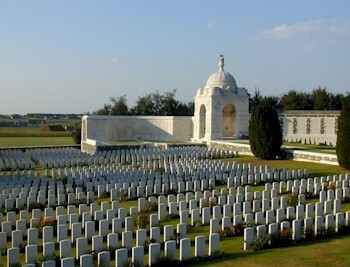 The name "Tyne Cot" is said to come from the Northumberland Fusiliers, seeing a resemblance between the German concrete pill boxes, which still stand in the middle of the cemetery, and typical Tynside workers' cottages - Tyne Cots. The stone wall surrounding the cemetery makes up the Tyne Cot Memorial to the Missing. On completion of the Menin Gate memorial to the missing in Ypres, it was discovered that it was too small to contain all the names that were originally planned. An arbitrary cut-off point of 15th August was chosen and the names of the UK missing after this date were inscribed on the Tyne Cot Memorial instead. The memorial contains the names of 33,783 soldiers of the UK forces and a further 1,176 New Zealanders. 1In the 1901 census the family is recorded at Church Street, Bramcote (Piece 3208 Folio 40). His brothers were George William (then aged 14, Joseph Charles (9), Frederick Edward (7) and Herbert Owen (4). Four of his sisters are recorded in 1901 - Sarah Jane (then aged 16), Constance L (12), Daisy E (10) and Victoria Ellen (7months). Three others - Gladys May, Winifred Irene and Muriel Rose - were born after the family moved to Beeston. 2Horace Arthur is listed in the school's Admission Register as entry 2148. His brothers, Joseph Charles, born 7th December 1892 and Frederick Edward, born 9th October 1895 were registered (Entries 1929 & 1930 respectively) at the school, together on the same day, when the family moved to Beeston.